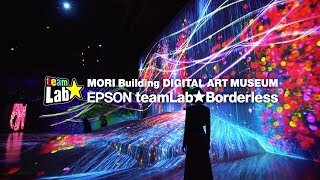 Japanese art collective TeamLab used projection mapping technologies to craft a magical dream world in the Digital Art Museum in Odaiba, Tokyo. Three interactive experiments by Jesse James Allen using HeavyM, Spout, Beautiful Chaos and Unity, a Leap Motion Controller, and original sound design. Front Pictures‘ audition on America’s Got Talent 2018 consisted of performing a videomapping routine while detailing a story of a person who must escape a video game. A holographic sport film for Reebok’s new line of treadmills by Five Fifty Five Productions, The Mill and We Are Midnight. The Prizome is a projection installation with real-time generated 3D video content and interactive effects. It is a collaboration between maker Adam Barlev, interactive developer Yasushi Harada and 3D artist Jimmz Zhang. Warsaw-based art collective panGenerator created an interactive installation that invites people to take a selfie, which is then projected onto a screen before turning into a gravel cascade. 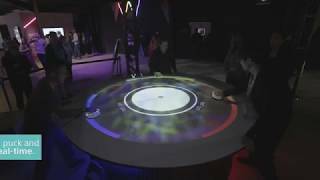 Sony has developed a virtual air hockey game that uses predictive algorithms and 1,000 fps sensor tracking. 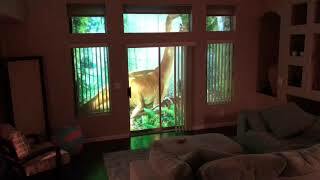 A father uses projectors to transform the view from the windows into a Jurassic wonderland, complete with interactive dinosaurs. Chair of Chaos is an interactive prototype installation by Roland Lehle and Benedikt Matern for the Adobe Creative Jam 2017 in Munich. Future Wife teamed up with Max Cooper to create an interactive experience that invites attendees to play with a giant inflatable sphere.